Why are Bhavnagar's Hindus preventing a Muslim trader from settling in their colony? What are the undercurrents at play even as the Vishwa Hindu Parishad fishes in troubled waters? Who is to blame for this fracas in Bhavnagar town? Prasanna D Zore/Rediff.com reports from ground zero. Nobody knows why these things happen. The song from the Bollywood film Love Aaj Kal greets you each time you call Ali Asghar Zaveri, a businessman in Bhavnagar. You call him over and over again, but Zaveri doesn't pick up the phone. You only get to hear this melody. You visit his home, tucked in a quiet lane off the busy Haluriya Chowk in Bhavnagar town. His mother Nafisa, dressed in traditional Bohra attire, informs you she doesn't know where her son is nor when he could be expected home. You visit again a couple of times, but the mother's response remains the same. One would wonder if Zaveri is a fugitive on the run. Zaveri is being hounded by the residents -- and also the media, say his friends -- of Krishna Nagar, a plush colony, predominantly rich and vegetarians Hindus and Jains, off Meghani Circle in the Bhavnagar, Gujarat. And that too for engaging in something that is perfectly legal. Zaveri -- aged anywhere between 27 and 40 depending on whose word you believe -- belongs to the Dawoodi Bohra community, a sect among Shia Muslims, that is known all over Gujarat and India for its business acumen and wealth generation. While a schism has existed between Gujarat's Hindus and Muslims for decades, Zaveri's plight since January has become a symbol of all that is wrong with the social relationships between Hindus and Muslims in the state, which has been ruled by Narendra Modi, the Bharatiya Janata Party's prime ministerial candidate, since 2001. 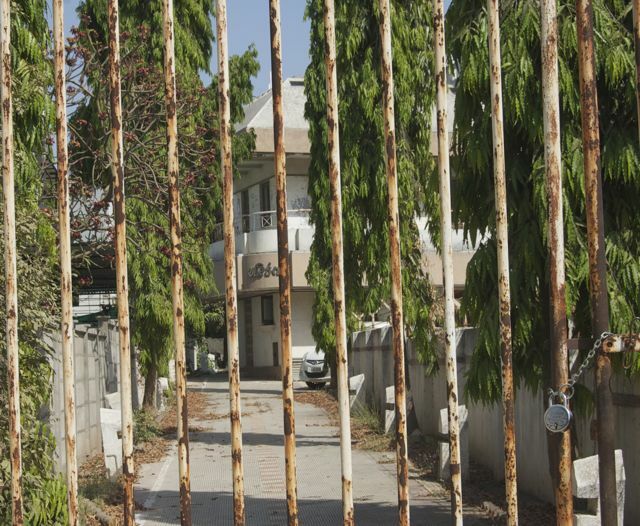 Last year, sometime in September, Zaveri and Kishoresinh Gohil, a Congress office bearer and a wealthy businessman, mutually entered into an agreement to buy Gohil's bungalow, Arihant, in Krishna Nagar. This January, after Makar Sankrant, a Hindu festival that celebrates the onset of the harvesting season, Zaveri moved in with masons and painters to redo the posh bungalow he had bought for Rs 4.9 million (Rs 49 lakh) after completing all the legal formalities. That set the residents of Krishna Nagar agog. Soon, around twenty Hindus met Zaveri and told him bluntly that he was not welcome in Krishna Nagar because he was a Muslim. They asked him to not intrude into a society that followed different eating and living habits compared to people from Zaveri's faith. 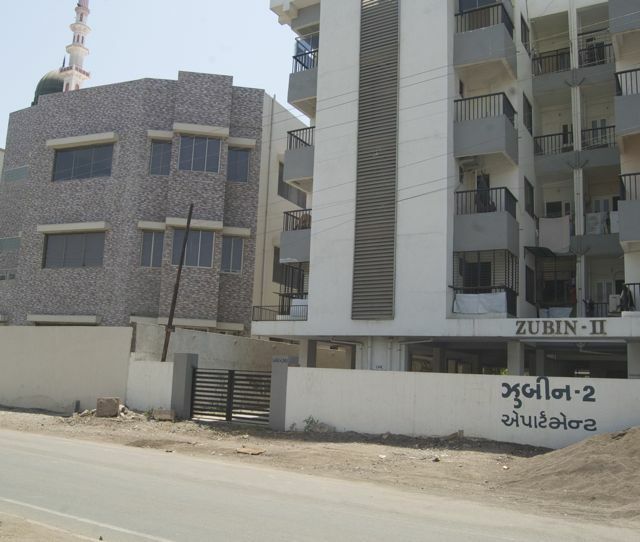 When Zaveri did not budge, the residents decided they would use tactics that have now become common at many places that witness a similar situation, and there are many such localities in Bhavnagar. "We decided to start singing Ram bhajans and Hanuman chalisa outside his gate," says one of Zaveri's neighbours in Krishna Nagar, insisting he not be identified by name or the location of his bungalow vis-a-vis Zaveri's home, lest his identity be revealed. "These Muslims come here with an ulterior aim," this neighbour opens up when he is convinced his name or the location of his bungalow won't be mentioned in this report. "They are always on the lookout for a distress sale by Hindus and then pay up double to clinch the deal," this Hindu alleges. He then points to a white bungalow, in front of Zaveri's Arihant, owned by someone named Patel. "As soon as Zaveri moved in, he approached Mr Patel to ask if he was interested in selling his property. This is their tendency. They buy one property first, then they scout for more and more. Once they figure out the number of people who can bite their bait, they move in for the kill by bringing in Muslim buyers for such deals," this neighbour alleges. Three Muslims already live in the vicinity. Zaveri would have been the fourth. "Their design is to overwhelm us by numbers and capture Hindu areas," alleges this Hindu. Kishoresinh Gohil acknowledges the presence of three Muslim homes in the vicinity. The neighbour, however, is quick to mention, almost paradoxically, that the residents of his colony are not against Muslims, but only against their eating and living styles. Equally quickly, he says a couple of Muslims have lived in the colony for 20 years and they have had no such issues with them. "Because they have adapted to the Hindu, vegetarian, way of living." Ilyas Majidi (name changed on request), also a Bohra, who stays with his four brothers in an elegantly done row of bungalows, a block away from where Zaveri's entry is being opposed, professes ignorance when asked about the issue. He mentions that his family has lived in the area for more than ten years without any problems. He refuses to respond if the family eats non-vegetarian food. Other areas where Muslims reportedly face opposition from Hindus in Bhavnagar are Ghogha Circle, Manekwadi, Crescent, Wadva Talavdi, Bhaga Talao, Peer Chhalla and Geeta Chowk: All upper and middle class housing colonies. Image: The locked gate of Arihant in Bhavnagar's Krishna Nagar. Ali Asghar Zaveri, who bought this bungalow from Kishoresinh Gohil, was not allowed to undertake renovation of this bungalow. 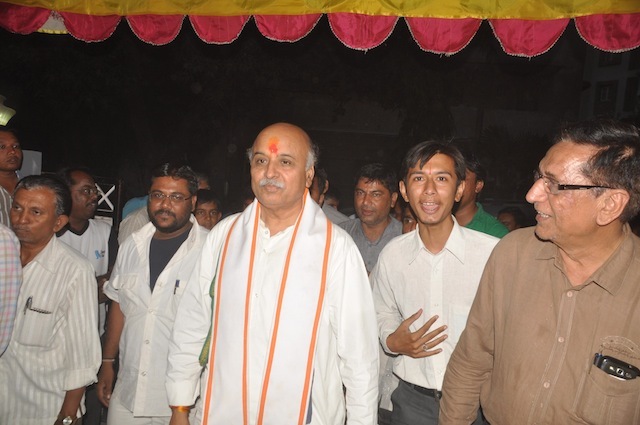 It was in this tense situation that the international working president of the Vishwa Hindu Parishad, Dr Pravin Togadia, visited Krishna Nagar, at the request of residents, and encouraged them to threaten Muslims away from Hindu areas by chanting bhajans, organising Ram durbars and playing Hanuman chalisa on loudspeakers that the issue went viral, including the video where Dr Togadia is allegedly instigating the locals. Kiritbhai Mistry, general secretary, VHP, Saurashtra, who was present at that meeting where Dr Togadia is alleged to have made those remarks, denies the contents of the video. Mistry, though, makes no efforts to hide the social abyss that exists between the Hindus and Muslims in Bhavnagar or in Gujarat and how the VHP is only giving voice to a strong local sentiment. Giving vent to the anger of Hindu locals, who Mistry claims had come to seek help from the VHP, when more than 1,000 petitions since 2004 to the district administration and state government, and even to the elected representatives of the Congress and Bharatiya Janata Party, to take some action against such real estate purchases by Muslims in Hindu areas, fell on deaf ears, Mistry says, "We can't allow our culture and religious practices to get spoiled by entry of Muslims who are non-vegetarians." "While men can tolerate the smell of eggs and meat, our women cover their faces with handkerchiefs when they pass Muslim households in such areas. Hamari aurte jaye to jaye kahan? (How can you expect our womenfolk to stay comfortably in such an environment?)" Mistry asks. Taking cognisance of such repeated petitions from locals, the VHP in 2005 sent a letter to Gujarat's then minister of state for home Amit Shah, requesting him to declare the Disturbed Areas Act in Bhavnagar town, citing the demographic changes unleashed by buying of real estate by Muslims in Hindu areas. The letter -- shared with Rediff.com by VHP's office bearer and advocate S D Jani, who is also a relative of Dr Togadia and at whose home the latter is alleged to have made the speech instigating Hindus -- outlines the systematic buying undertaken by Muslims since February 2002 (post the Gujarat riots) and how it had led to a huge resentment among the Hindus in Bhavnagar. The centrepiece of this VHP letter to Shah is that unabated buying by Muslims in Hindu areas was leading to serious damage to the communal harmony of the town consequent of which peace is disturbed in these areas. The letter goes on to demand the imposition of the Disturbed Areas Act in Bhavnagar to maintain peace and harmony. Amit Shah in turn forwarded this letter to the state's then revenue minister Kaushik Patel, who in turn responded by saying that the matter has been taken cognisance of and wrote back to the VHP, saying he had asked the chief secretary, revenue department, to take appropriate action. Rediff.com is in the possession of this correspondence among the VHP, Shah and Patel. Once implemented, the Disturbed Areas Act restricts property transactions in areas that are deemed to be 'communally sensitive' by the state/district administration. The sale happens only after getting approvals from the district collector. The state's revenue department undertakes the task of notifying an area as communally sensitive or otherwise based on its intelligence inputs and findings and opinions of the local population. Already in place in many parts of Ahmedabad, Baroda and Bharuch, the Disturbed Areas Act was ostensibly enacted to prevent distress sale by residents of areas that have Hindus and Muslims sharing a 'border'. "The state government has yet to take any concrete steps to stop such blatant geographical spread of Muslims in Hindu areas," says Mistry, justifying the strong hand tactics adopted by the locals to drive Ali Asghar Zaveri away from Krishna Nagar. 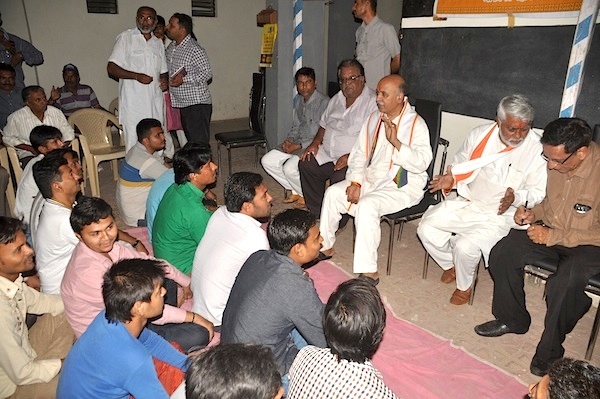 Image: VHP International Working President Dr Pravin Togadia outside a makeshift VHP office in Krishna Nagar on the night of April 19, the day he is alleged to have asked the residents to forcibly take over properties owned by Muslims in Hindu areas without fearing the law. More than a week after the issue erupted, Zaveri's white SUV remains parked inside the locked compound of Arihant. Three policemen -- one sleeping on a charpoy kindly offered by the locals and the remaining two engaged in chit-chat -- stand guard on the quiet road next to their patrol vehicle. "Everything is calm and peaceful here since that day (April 19 when allegedly Dr Togadia along with scores of Krishna Nagar residents gheraoed Arihant and chanted hymns and devotional songs)," the policemen tell this correspondent offering him a seat. The police has been asked to maintain a vigil outside Arihant as the investigation into Dr Togadia's alleged speech gets underway. The VHP leader has been booked under Section 153 (B) -- that charges a person for making a speech or using words that is prejudicial to national integration -- and Section 188 of the Indian Penal Code that deals with disobedience to order duly promulgated by a public servant. Superintendent of Police, Bhavnagar, Maninder Partap Singh Pawar told Rediff.com over the telephone that the alleged CD has been sent for forensic analysis and the reports are likely to take some time before further action can be initiated against Dr Togadia. "The FSL will likely submit its report in two to three weeks. Based on the findings of the forensic analysis related to authenticity of the CD and its content due action will be taken against those found guilty," Pawar said. Meanwhile, the district administration under Collector and District Magistrate Pravin Solanki has requisitioned four companies of paramilitary forces to quell any untoward occurence even as the town votes April 30. "There could be some trouble in rural Bhavnagar where there could be some clashes between the predominant Durbars (Kshatriyas) and Kolis (fisherfolk) around Ghogha village," says an intelligence officer from the district administration. Collector Solanki says the district administration is all set for a peaceful election. 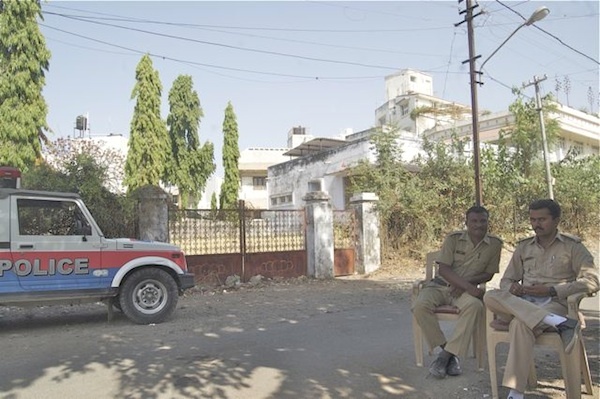 "We do not anticipate any problem at all," he told Rediff.com "Bhavnagar has never witnessed election- related violence." There is an interesting spin that some police officers give to why Dr Togadia has not yet been arrested despite being charged under Sections 153 (B) and 188 of the IPC. "Why should we make him a martyr? Let the election pass," says a senior district police officer requesting anonymity. Rumours making the rounds in this politically tense but peaceful situation claim that Dr Togadia will surrender early May with over 15,000 supporters. Mistry and Jani of the VHP did not confirm or deny this rumour. Image: Policemen maintain a vigil outside Arihant. The man whose predicament has highlighted the issues faced by many Muslims in Gujarat and, one may quickly add even in Maharashtra, has become somewhat of a phantom. When you visit the Zaveri home on Friday his father tells you that Ali Asghar must be in his office just a furlong away. You come out and ask a passerby for directions. He is Zaveri's friend and offers to help by calling him up. No sooner does Zaveri realise that a mediaperson is seeking his audience he tells his friend to tell this correspondent that he is in Baroda. The voice through the earphone rings loud enough to hear Zaveri at the other end. You can hear Zaveri, he is just 200 metres away from his home, but you can't see him, you can't meet him. Ever since the controversy broke out on April 19 -- the FIR against Dr Togadia was filed only on April 21 says investigating officer C M Dodiya of the B Division police station in the town -- Zaveri has doggedly avoided the media. Whatever one gathers about Zaveri is only through his friends, many BJP workers among them and Kishoresinh Gohil, the man whose sale of his bungalow has acquired national limelight. His friends have started referring to him as Phantom, more in empathy than jest. Anwar and three others -- Altaf, Hussain and Shabbir -- wear orange and green jackets with the BJP's lotus electoral symbol prominently displayed on the jacket's rear. They don't agree on Zaveri's age. Their range varies from 27 to 35. It is about 3 pm outside Haluriya Chowk. The afternoon prayers on Saturday are over and Anwar and his friends have come home to Haluriya Chowk after an excited election campaign in favour of the BJP's Bhartiben Shiyal. "Alli (the extra stress on 'l' is his) is a nice man. He has worked hard to earn his bones," he says about how Zaveri -- a metal scrap dealer, having his business interests in Alang, Asia's biggest shipbreaking yard, some 50 kms off Bhavnagar -- made his money. Without getting into controversies Anwar hopes his friend gets out of this situation soon. "There is not much problem between Hindus and Muslims in Bhavnagar," he says. "It is only the outsiders who enjoy themselves by creating problems in this town," he says without identifying who these outsiders are. Another set of friends, Congress workers this time, allege that this is a BJP ploy to polarise voters to swing Hindu votes in their favour. "The BJP fears that the Kolis, Muslims and Durbars will vote en masse for the Congress. They are desperate to win this BJP stronghold (Rajendrasinh Rana, a Kshatriya and a five-time BJP MP from Bhavnagar Lok Sabha constituency was denied a ticket) this time too. Fearing loss, they are using Togadia to foment trouble and consolidate Hindu votes," says Majid (name changed on request). Majid says there could be trouble if the police acts against Dr Togadia to show that the BJP and VHP are not together in making Zaveri an excuse to consolidate the Hindu votebank. Gohil says he had seen Zaveri only on two occasions -- when they first met to fix the deal last year and later in January when the agreement was sealed at the registrar's office. "He looks young, like he is 35, 40," Gohil says when asked to describe Zaveri. Image: VHP General Secretary Kiritbhai Mistry (standing, left, in a white outfit) and S D Jani (extreme right, in brown shirt) and VHP International Working President Pravin Togadia at a meeting on the night of April 19. Hina Shah is a former mayor of Bhavnagar. Having quit the BJP 18 months ago "over an issue", she says, will never become public, Shah now empathises with the Aam Aadmi Party. Shah says she doesn't harbour any ill-feeling towards Muslims, but maintains that they should not purchase property and permanently reside in Hindu areas. She asserts she is not the only one to think in that manner. "Go to any person in our neighbourhood and you will get to hear the same thing," she says. Muktaben Mehta (name changed on request), a resident of Geeta Chowk, who stays two blocks from Shah's home and closer to the 'border' says Shishu Vihar, her adjacent neighbourhood, had only five per cent Muslims four years ago. "Today, Shishu Vihar is 95 per cent Muslim," she claims before expounding the theory -- how Muslims are overwhelming the Hindus -- that is so common in middle class and upper middle class areas of Bhavnagar. Ashish Shah, a Jain businessman of Geeta Chowk, recounts a tale according to which a Muslim bought a three bedroom apartment from a needy Hindu family. "The father had to marry off four daughters. He needed Rs 40 lakh (Rs 4 million) for his apartment. The market rate would have fetched him only Rs 25 lakh (Rs 2.5 million). But this Muslim businessman offered him the amount he wanted," Shah claims. But Shah says the Hindu residents would have none of it and compelled the family to reverse the deal. "One of our Hindu brothers paid him the original owner Rs 40 lakh for the house," he says. Apart from social and religious reasons there are economic costs that get the Hindu residents up in arms against such purchases of property by Muslims in Hindu localities. This is how socio-religious prejudices impact property rates. A Muslim, Mehta alleges, pays any price to get hold of a prime property in Hindu areas. "This artificially inflates the cost of the property and distorts the market rate," she alleges. Conversely, rates of Hindu houses whose neighbours are Muslims fall as Hindus don't prefer to purchase a property with Muslims as neighbours. "Such Hindus have no option but to sell their houses to Muslims who happily pay a premium so that they can enter Hindu areas," Mehta claims. The only saving grace -- if one can call it that -- is this socially divided town continues to witness business relations between the two communities. "A lot of Gujaratis have strong business linkages with Muslims," says Muktaben Mehta. "They can be our business partners, but socially we prefer to be aloof from them." "If the Disturbed Areas Act is not enforced soon in Bhavnagar," adds Mehta, "Hindus will have a tough time coping with the problem." The situation in Bhavnagar as it seems today is far from that of a disturbed area. Image: A mosque next to a building in Bhavnagar's Shishu Vihar extension. Hindus from adjacent Geeta Chowk claim the Muslims have exponentially increased their dwellings in the area in the last four years changing the demographics of the neighbourhood. NaMo, will you surprise us all?